For most, the word “evergreen” evokes the thought of a pine, spruce or fir tree. These are the trees that give year-round structure to our gardens and provide points to hold our attention and direct our focus. They are the forests that we cut for timber, paper and fuel. Without the dominance of the evergreen in the boreal kingdom we would surely have much poorer and colder lives. While these giants provide much for us there are many other plants that share the designation and description of evergreen. To simplify and to broaden the term, evergreen means something that holds on to its photosynthetic tissue for at least a full year. 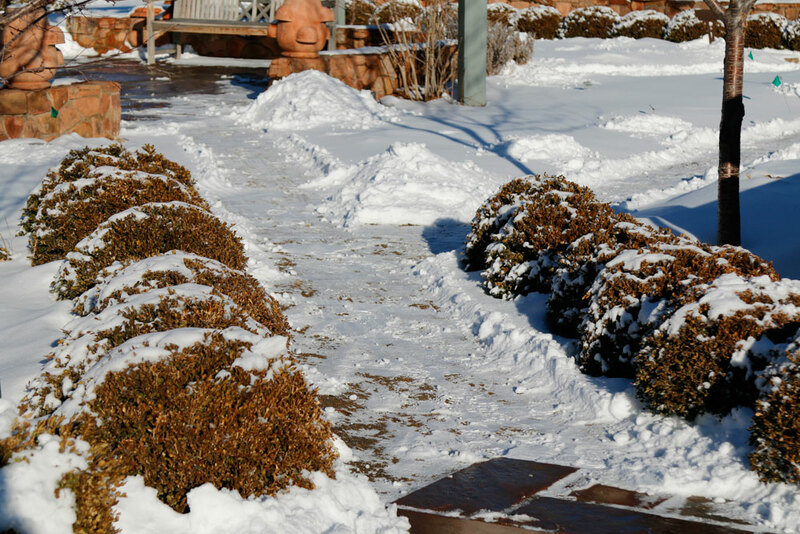 Given this broader definition we can walk the garden in a new light of appreciation for evergreen plants. 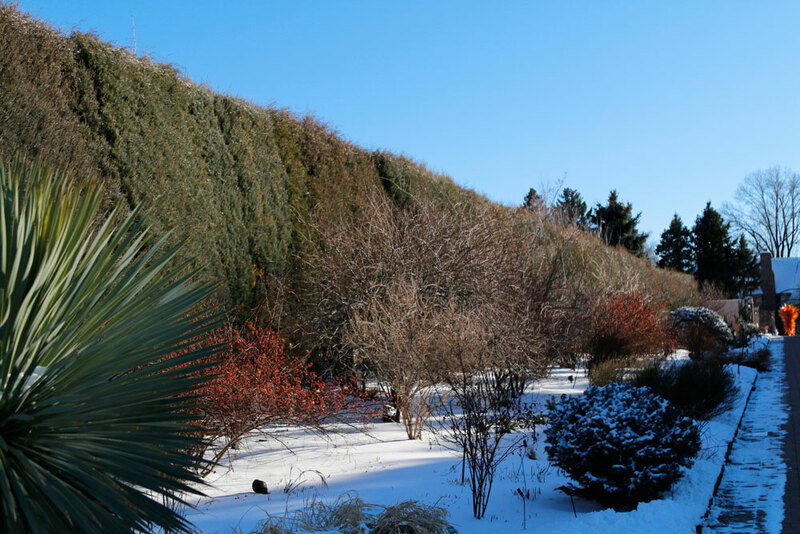 From the moment you enter the Gardens you are greeted by a long hedge of our native Juniperus scopulorum (Rocky Mountain juniper). This scale-forming evergreen is many things to the O’Fallon Perennial Walk. It is the greenscreen before which a yearlong ballet of color and form dance. Its sheer height creates the illusion of a much larger, grander space. The rather formal specimens that comprise this hedge are nothing like what you would find growing tortured and wild in our adjacent foothills. Moving past the perennial garden we encounter another structural wonder, but this time there is a splash of color and sense of delight and movement. 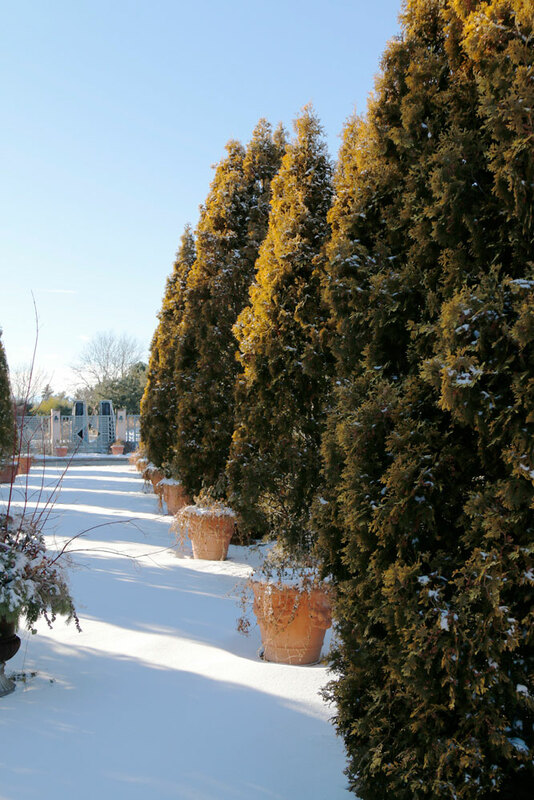 The Romantic Gardens’ allée is created with Thuja occidentalis ‘Yellow Ribbon’. Here in front of these glowing spires hundreds of couples have sworn sacred oaths. Some sort or form of evergreen plant can be found in every garden on our campus but there is one garden that is themed just to showcase unique mutations in traditional evergreens. 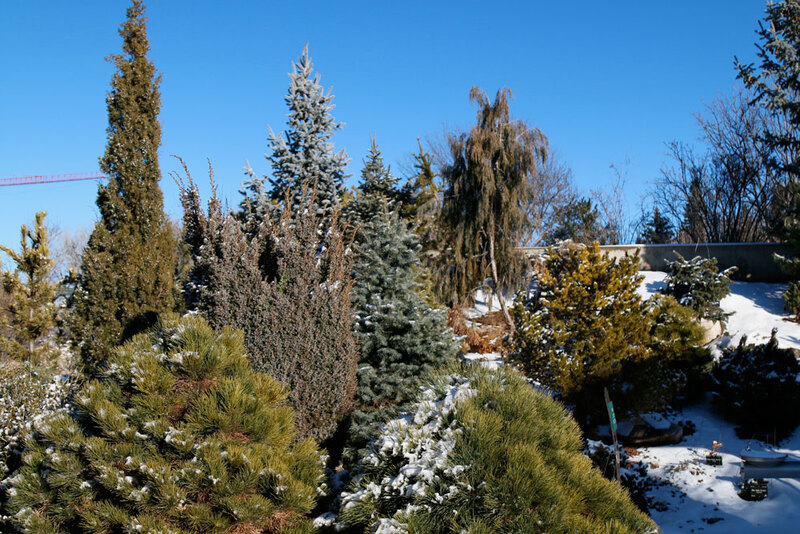 This is the Dwarf Conifer Collection. Most trees in this garden have some form of mutated, stunted or deviant growth habit and are clustered together to highlight how special and different these variants can be. Many of these plants have been collected in the Rocky Mountains and are grafted onto a “normal” root stock. Finding and propagating “dwarf conifers” is an entire industry in and of itself. 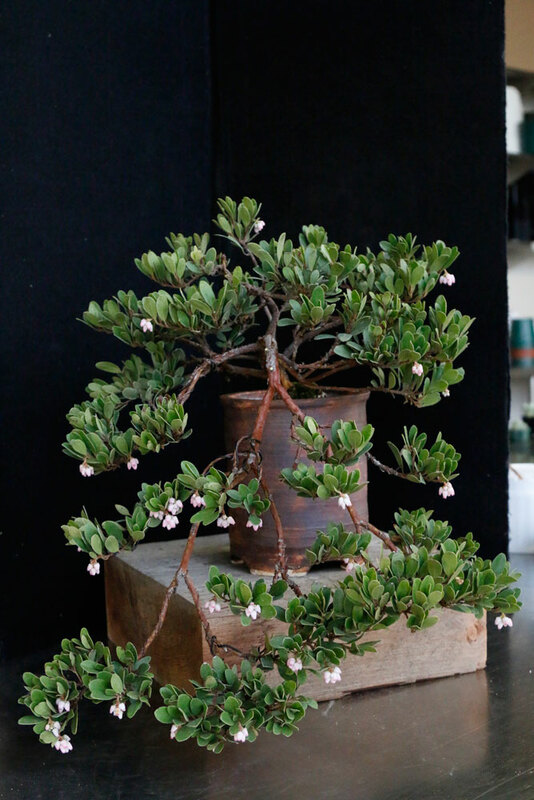 Collectors from around the world come to study and evaluate these fascinating plants. Up till now we have talked about mostly coniferous plants and how we associate them as having evergreen foliage. But another important group of plants can be seen on the east face of Dryland Mesa. The plants here are what we term broadleaf evergreens and their scientific name is Arctostaphylos. 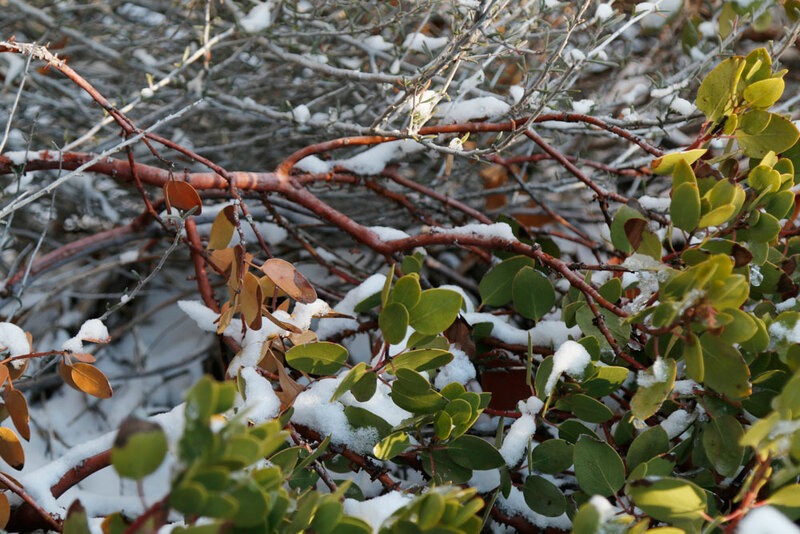 These shrubs are very important members of our western flora and represent examples of species from Colorado and neighboring states. Most have round, thick, almost leathery leaves that have a soft green glow and are possibly best appreciated with a background of snow to accentuate the exfoliating rust-colored bark and the dancing green leaves. Wild and beautiful, these are specimens that are left largely untouched and allowed to grow to whatever form the local climate dictates. 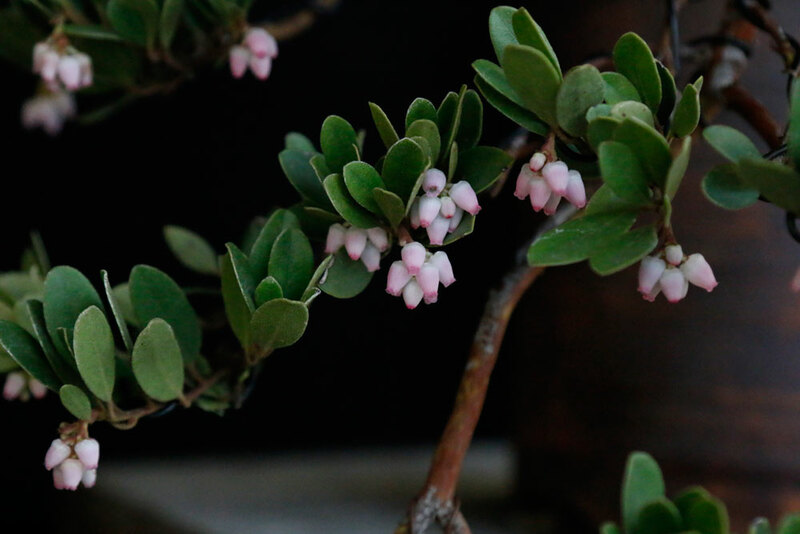 The broadleaved evergreen Arctostaphylos x coloradensis has so many attractive qualities that staff member Larry Jackel has turned a rooted cutting of one into a bonsai. This selection blooms quite early and often goes on display in Marnie's Pavilion while in full flower in February. A little farther on there is another example of a broadleaf evergreen. Used as a foundation planting and sculpted as a hedge, garden boxwoods (Buxus ‘Green Velvet’) are grown to create separation in the garden beds of Le Potager.